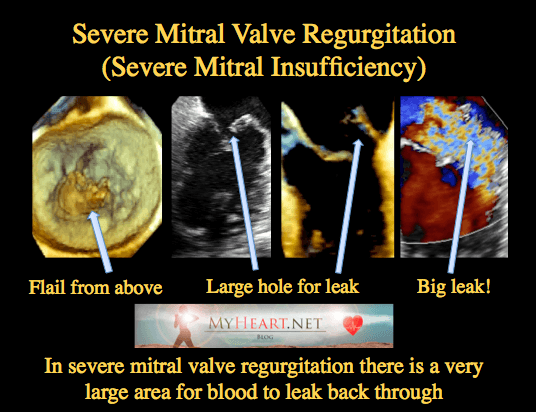 What is Mitral Valve Regurgitation (Mitral Insufficiency)? 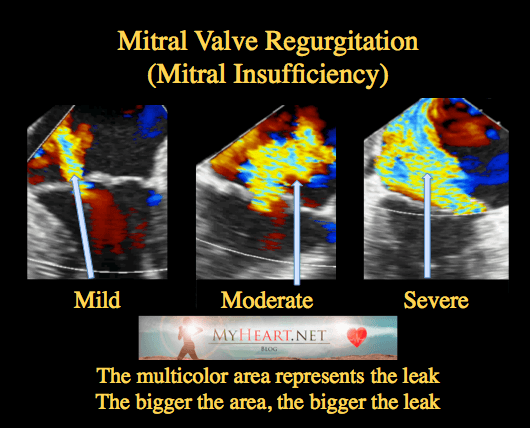 Mitral Valve Regurgitation also known as Mitral Insufficiency is basically a leaky mitral valve. As a doctor that specializes in heart valve disease, this is the most common valve problem I see. The mitral valve stops blood flowing backwards from the main chamber of the heart and allows it to go forward to the body where it is needed. In mitral valve regurgitation the blood is allowed to flow backward. If too much blood flows backward, such as in severe mitral valve regurgitation, the body wont get the blood it needs to function and symptoms can develop. What Causes Mitral Valve Regurgitation (Mitral Insufficiency)? The most common cause of mitral valve regurgitation (mitral insufficiency) is mitral valve prolapse. Other causes of mitral valve regurgitation (mitral insufficiency) are an enlarged heart, calcium build up, and also coronary artery disease. See this previous post for a detailed review of mitral valve prolapse. In mitral valve prolapse the valve becomes floppy and in severe prolapse the valve allows a lot of blood to flow backward. There is a condition known as flail leaflet where the strings holding the valve snap and allow the valve to swing freely backward leading to very severe mitral valve regurgitation (severe mitral insufficiency). 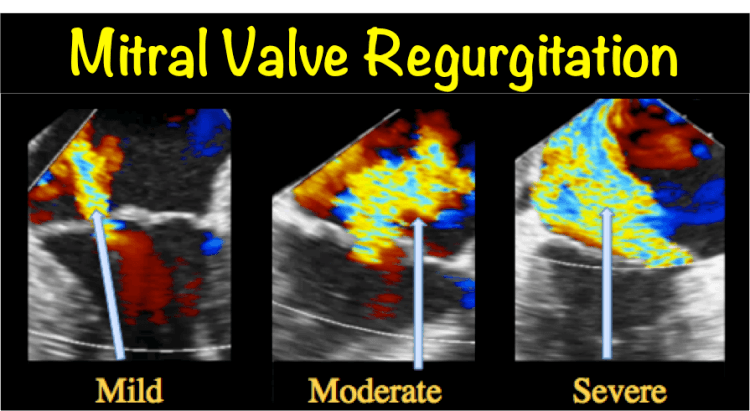 How is Mitral Valve Regurgitation (Mitral Insufficiency) Graded? The pictures shown here are from a test known as an echocardiogram, which is an ultrasound-scan of the heart and the most common method used to assess heart valves. Its important to note that this test can be variable and when important decisions need to be made regarding this, such as in severe cases of mitral valve regurgitation (mitral insufficiency), it really should be assessed by a dedicated expert. See the table for an idea of how the severity of regurgitation is determined. When more than 50% of the blood leaks backward it is in a severe category and when less then 20-30% leaks backwards it’s in a milder category. 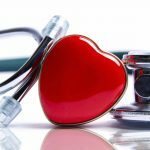 How is Mitral Valve Regurgitation (Mitral Insufficiency) Treated? Treatment of mitral valve regurgitation (mitral insufficiency) is very dependent on the underlying cause. Mild to moderate regurgitation typically doesn’t require any dedicated treatment. If the cause is heart failure or coronary artery disease, then initial attempts are made to treat the heart failure first, typically with medicines or sometimes procedures to restore the blood flow to the arteries. In cases of severe mitral valve regurgitation (severe mitral insufficiency) surgery may be considered to fix the valve, or consideration of one of the newer minimally invasive techniques that I will discuss in a further post. In the case of mitral valve prolapse with mitral valve regurgitation, there is no specific treatment for the valve. There is some evidence that beta-blockers may be helpful, although larger studies are required to confirm this before it can be suggested widely. When there is severe mitral valve regurgitation, there should be consideration of fixing the valve, especially in the presence of symptoms, abnormal heart rhythm, or significant heart enlargement. In the case of moderate mitral valve regurgitation the key is to watch the valve closely over time, and monitor the size of the heart and the degree of the leakiness. Decisions regarding timing of intervention for mitral valve regurgitation (mitral insufficiency) disease are often complex and ideally should be made by dedicated specialists. THANK YOU!!! I have been scouring the internet trying to find a reputable website about Mitral Valve Prolapse/Regurgitation that is easy to understand AND thorough. This site is perfect!! I find the diagrams and charts especially useful!! 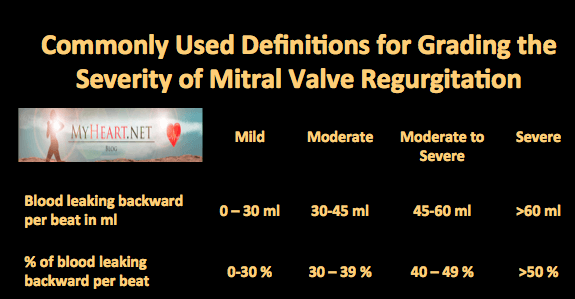 Seriously, “Commonly Used Definitions for Grading the Severity of Mitral Valve Regurgitation” illustration is exactly what I’ve been trying to find!! Yes, I’ve found the same information on multiple sites. But with this I don’t have to go between my notes or try to remember where I saw what! It’s a perfect “at a glance” guide that can easily be referred back to when needed. I’ve read two other articles as well and found them just as informative and relevant to what I was looking for. I don’t mean to sound so dramatic….I’m genuinely excited that I found this site! This topic has always been interesting to me since I was told I had a “leaky valve”. However, I recently learned that mine has gone from the mild to moderate range. I want to dig a little deeper and learn more than just general information about this condition. So again, thank you!! 1. Overall good image quality. 2. Trace mitral regurgitation with preservation of left atrial size. 4. Indirect evidence of left ventricular diastolic dysfunction. 5. Preserved left ventricular systolic function with an ejection fraction in the 55-60% range. Should I be concerned over any of these stated findings? I was informed that I may have moderate tricuspid regurgitation and pulmonary HTN pressure. I have had shortness of breath, dizziness, lightheaded. I have also read side effects to some medications. I have been in and out the ER. My EKG comes back good, my blood work comes back good and the ultrasound for blood clots in my legs comes back good and so does blood clots overrall. So how do I know it’s not the side effects to other medications?